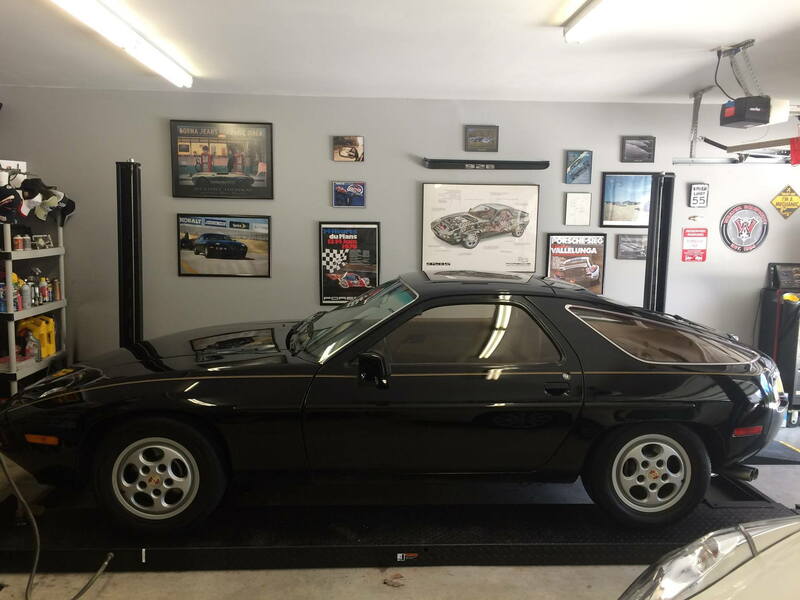 What were your tips for installation, ceiling lights, under lift lights, and other things to help showcase your 928 or make for a good 928 perch? Yes. 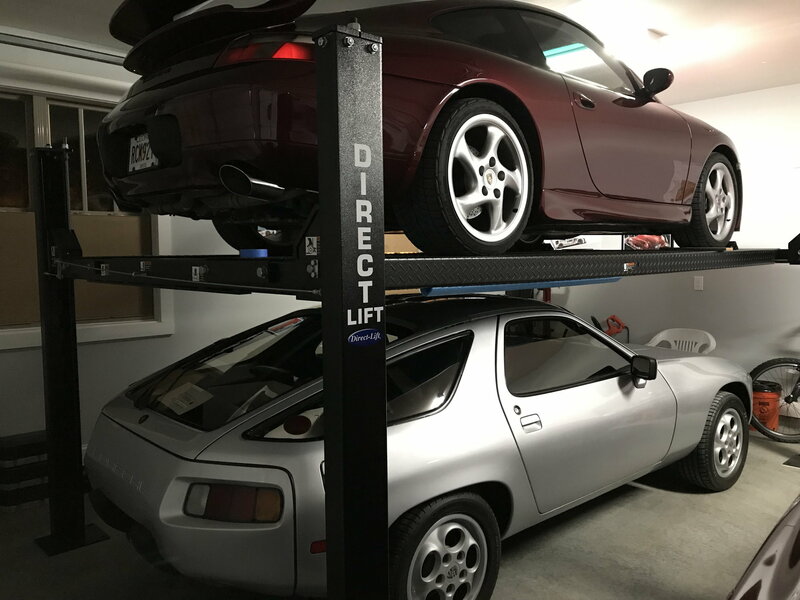 Mine's a 4 post also, a Direct Lift Propark 9+ that's big enough to get my wife's Chevy K3500 Dually Crew Cab off the ground (and also park under it), so it's overkill for the 928. She never parks under the lift anyway. You'll want the rolling jack to go with it otherwise you need to use a jack tray, which is a really bad idea IMO. I tell folks it's the best tool investment I ever made. 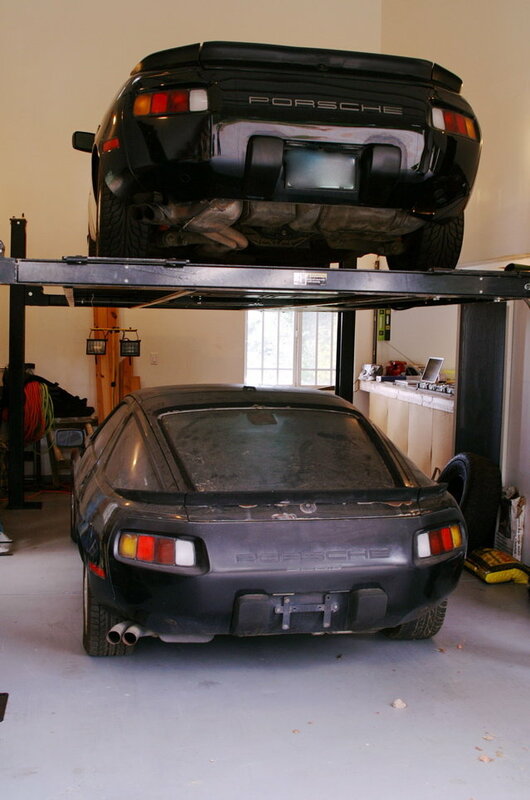 I wouldn't think about owning a 928 (or a 944) without one. I spent way too many years laying on gravel under cars to want to do it now. As for lights, it's really hard to light from above. I used 300W halogen's (6) in the old shop, the new one uses LEDs, which are much, much better. 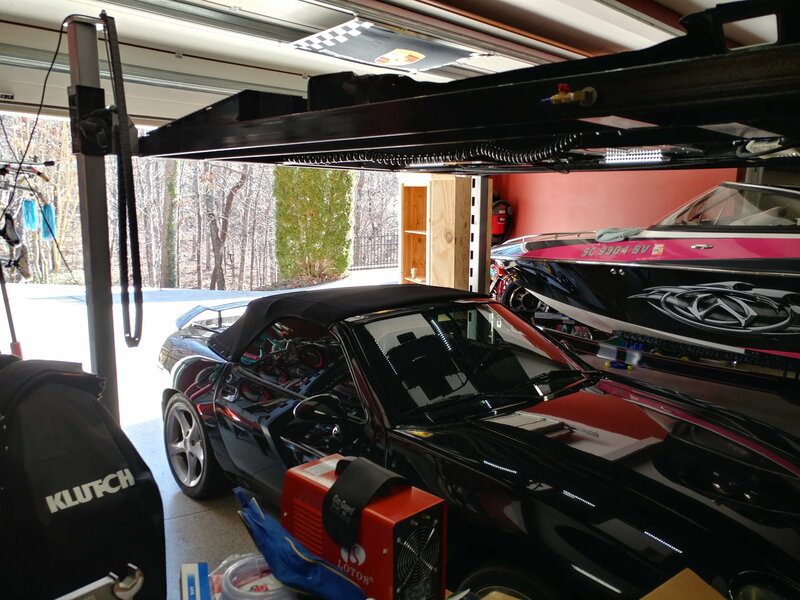 For under lift light I use a portable dual head halogen light stand, I don't think permanent under lift lights would be a real good idea but I also think the halogens are too hot so I'll be converting the light stand to halogen. Old Shop. Part car below. 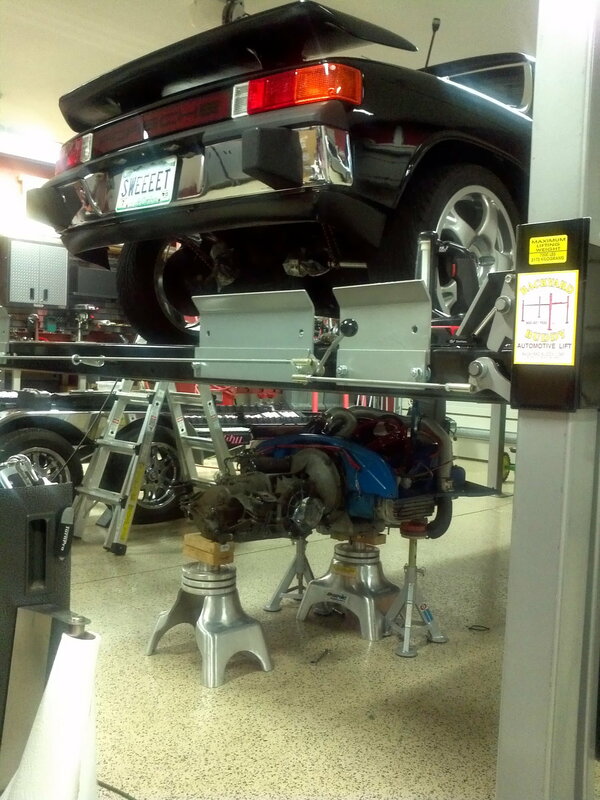 A 2 post lift is what you need if you intend to work on the car having good access to the underbody. My lift has a fluorescent lamp mounted on each post. The ceiling height need to be 3,7m or 12 feet. I had the luxury of designing a purpose-built garage (https://rennlist.com/forums/928-foru...clubhouse.html). Two-post or four-post? I resolved the dilemma by putting in one of each. With my experience so far, if I could have only one ... I still don't know which would be best. I've done both some work and some storage on the four-post, but most work is on the two-post, from changing wheels to dropping the TT/transmission. For many people, it's a question like "would you rather have a set of open-end wrenches or a socket set?" Ceiling height was obtained by using scissor trusses. It's common to have a 3:12 pitch on the bottom chords. 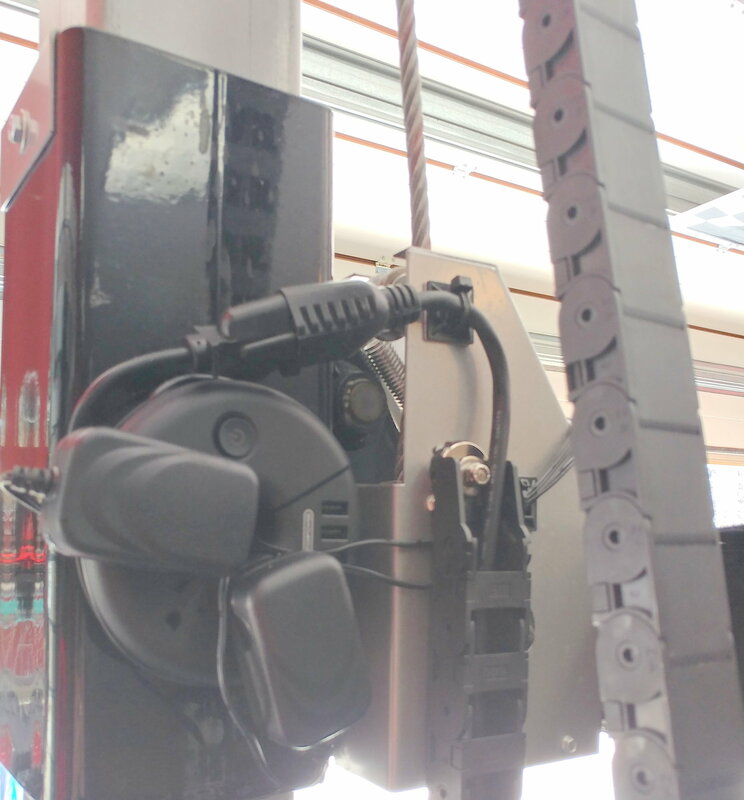 Perched on 10-foot walls, a 28-foot depth provided enough height. Not 26 feet - my original plan. I put in a bunch of 50-watt LED bulbs in ordinary bare-bulb fixtures. Cheap and easy. Everything above 8 feet is painted white - a giant reflector. I can't imagine better lighting - except that without a white floor, there's still not enough light underneath the car for my old eyes. Curt, you are all right, our old eyes need much light. I use a fluorescent working lamp (picture) all the time when I am working under the car. 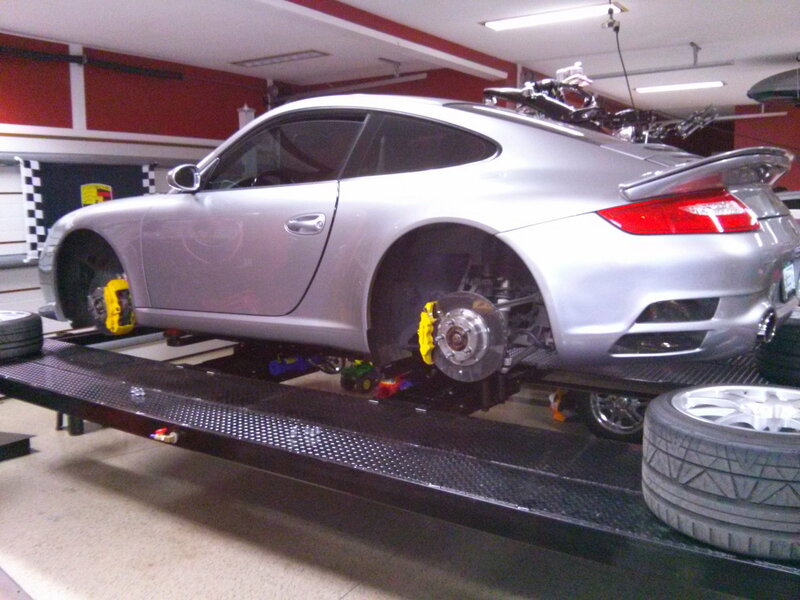 A lift is good but having the car on stands is much better for you. It is good exercise to crawl under the car and up again every time you need a new tool. By the way I have been to Chestertown once but I did not see one single 928. My second cousin is living not far from Forest Lake. 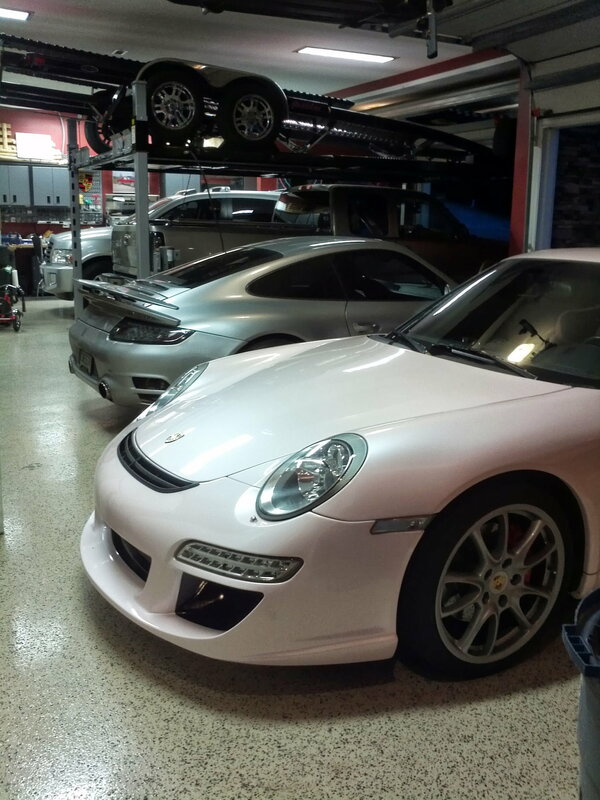 Damn Ake, I am drooling all over myself looking at both your car and garage. LOL. Very nice. I've always loved both you and your wife's cars. While fussing with my lighting design, I felt a little foolish: no matter what, I have to wear a headlamp, which is much cheaper. Instead of all the fancy lighting, I could get two, and keep one on the charger at all times. Maybe a really good one, like my dentist uses. Mine was a tight fit but it works. 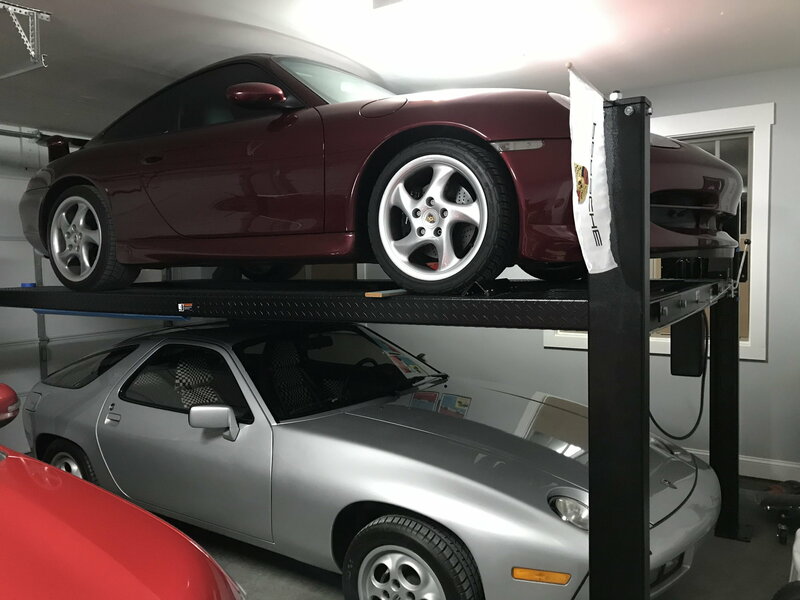 I have about 2.5” of spare room above the top car, and about 4” above the bottom car. I had a side mount door opener installed plus we raised the upper portion of the door track by about 6”. 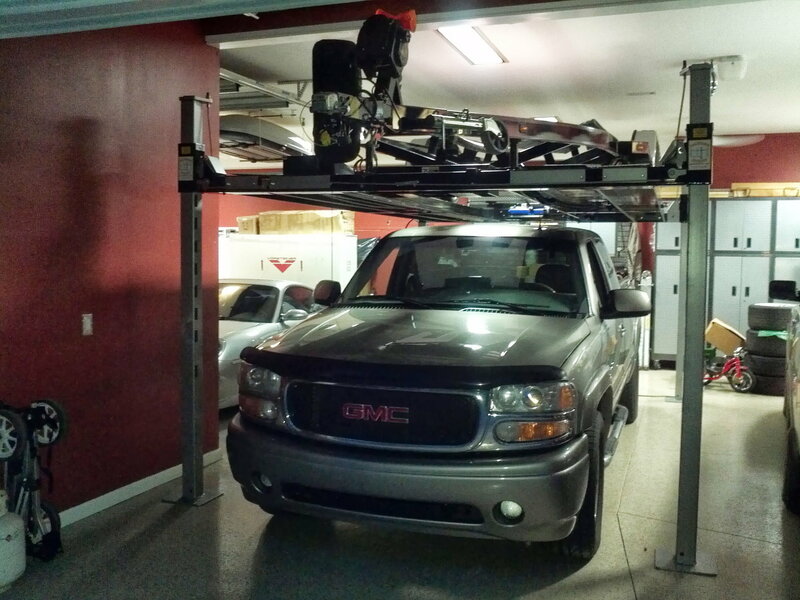 This allowed enough travel room so that I can have a car on top and still fully open the garage door. YMMV as this is all dependent on the measurements of your space. This Fall I dropped the oil pan to inspect and change the oil baffle, changed the engine oil and trans fluid, changed the pads/rotors/lines/fluid, and dropped the transmission and changed the clutch/flywheel/slave/fork. Given the amount of labor hours this work required, I’d say the lift is pretty much paid off now. No it is Forest Lake, a smaller lake to the east of road no. 9 a bit south of Chestertown. You go in Forest Lake Road where my second cousin lives and at the end of that road you have Forest Lake Camp. Think we went for a swim in Forest Lake when we were over there. 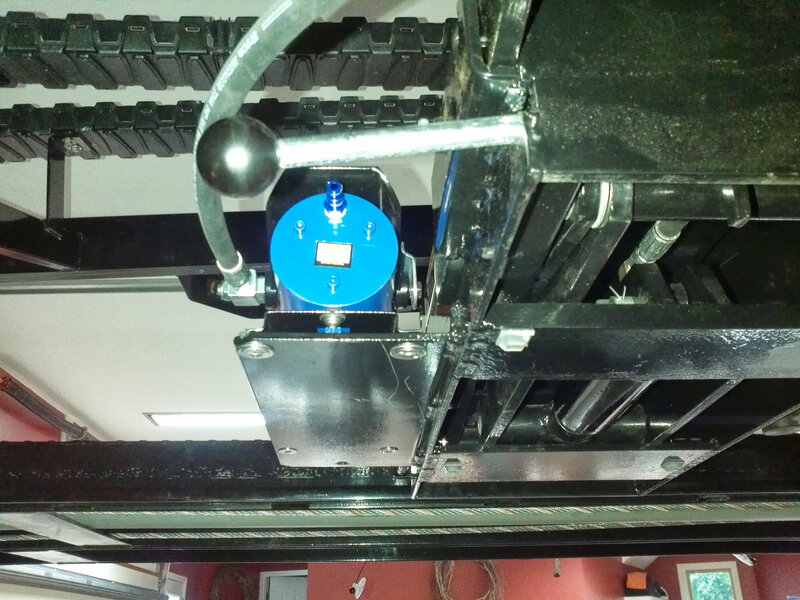 When working under the car being in the lift I imagine a head lamp will be in the way hitting the underside of the car all the time. That is what my head is doing and a helmet will not help. 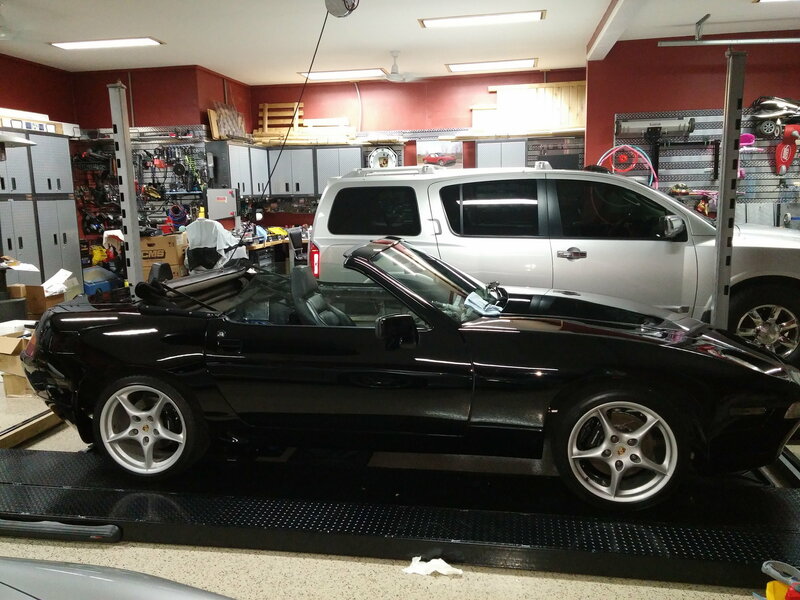 Had a look at your garage thread. Congratulations to an excellent garage. Thank you Chris for the kind words. 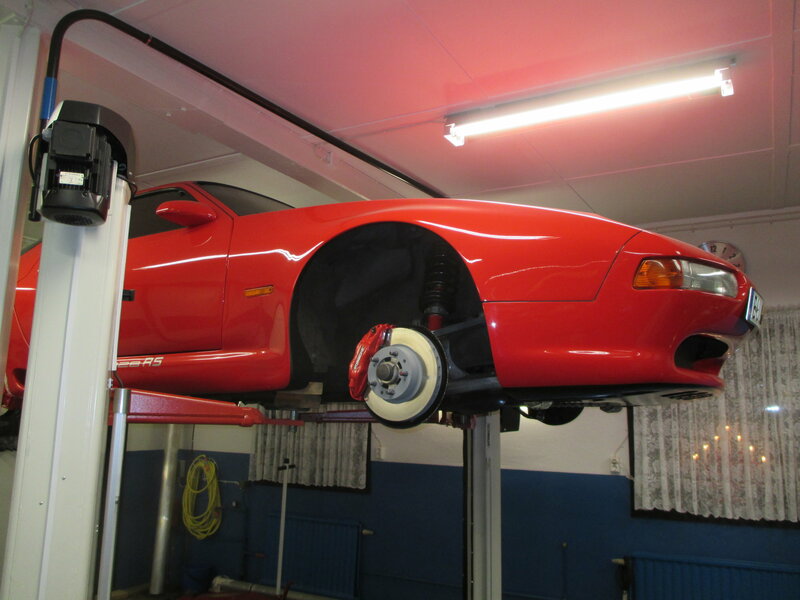 It seems I am working on my wife´s cars all the time and find very little time for my own cars. She has an old Volvo 745 Station Wagon, a BMW Alpina B10 4,6 V8 Station Wagon and the red 928 Strosek Ultra. Like your wife she is very understanding at least as long as I am doing her cars and she does not hesitate to make me pancakes anytime I want - LOL. 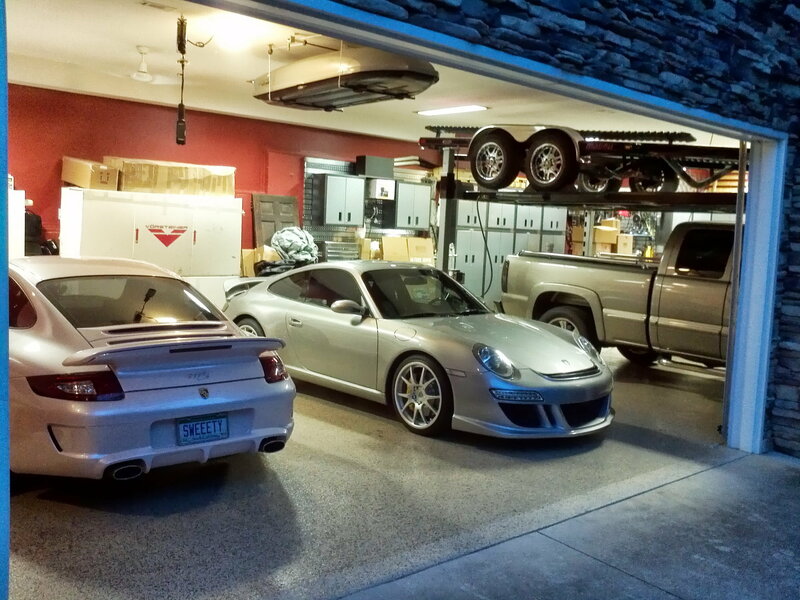 A picture of the outside of the garage when we had a Porsche get together. 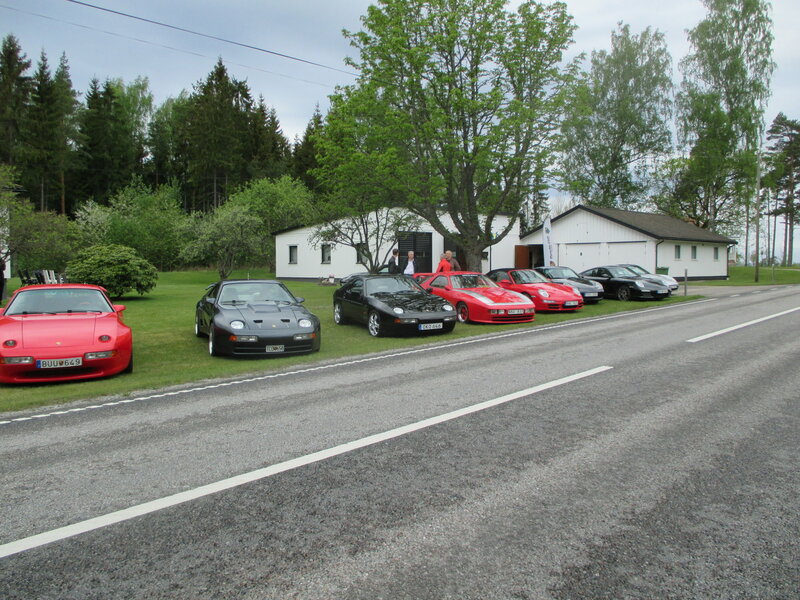 Two of our cars to the left and our friend Thomas´s red 928 DP in the middle of the picture. I have a custom Backyard Buddy lift. It's custom in that it's their taller extended height supports paired with their trailer storage ramps (wider) along with a 2nd set of ramps. This gives me enough width for the wakeboard boat trailer but makes it narrow enough for the 914. Also had them powdercoat it grey and black instead of red and black. 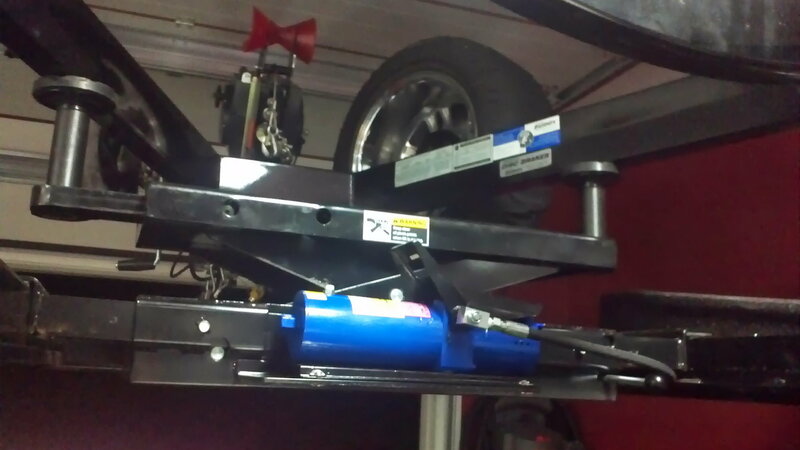 I have dual sliding pneumatic bridge jacks to be able to lift the car off the lift while it's on the lift for brake and wheel work and a rolling drain pan for oil changes. 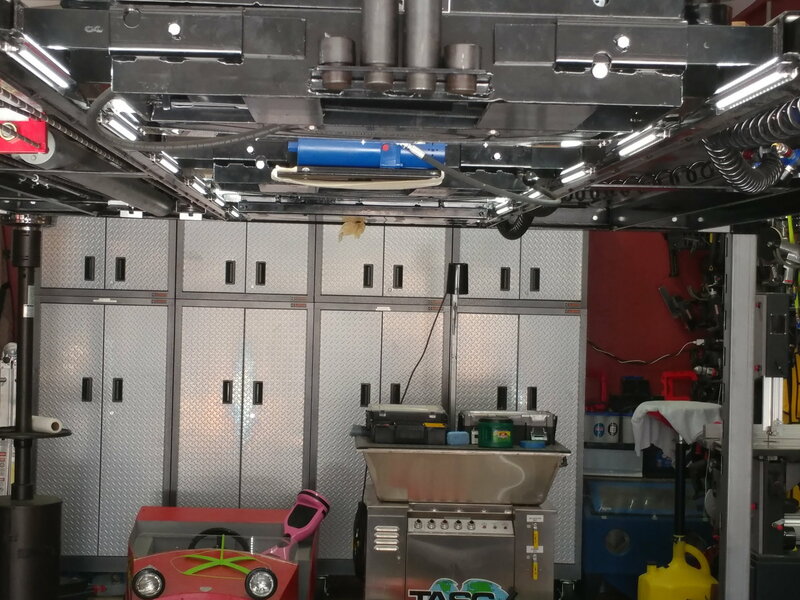 I added LED lights on 90 degree angle iron, secured by magnets so lighting shines up onto the car I'm working on and down to whatever is parked below it if one is up for storage while the other is being worked on. Ceiling is 11' 4". 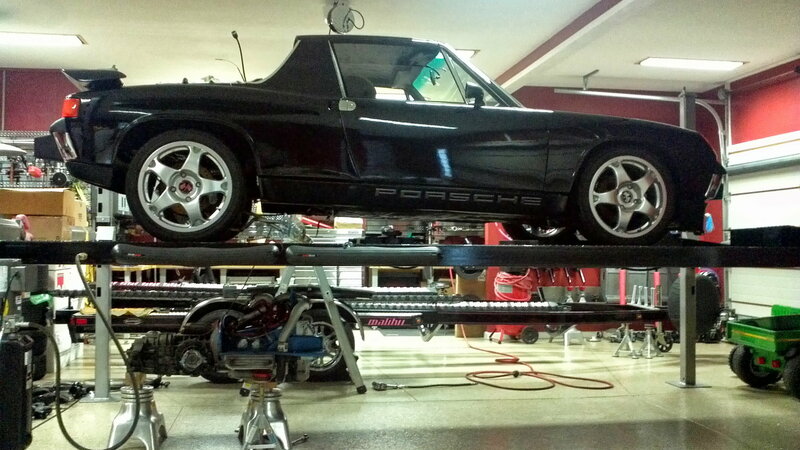 12' would have let me put it all the way up with the 914 on it so I could walk underneath without tipping my head down. Ceilings in the new garage will be 12' and over the lift bay they'll be vaulted without a floor above it. 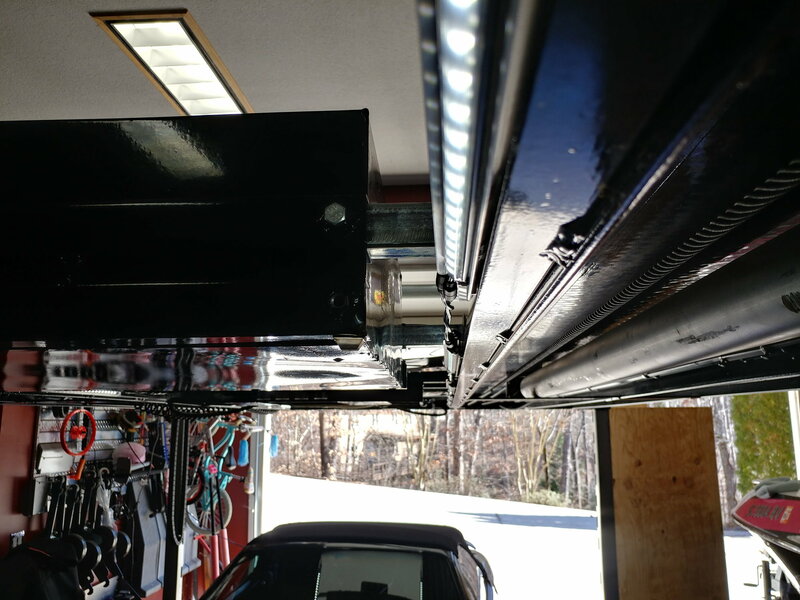 Garage doors have Jackshaft openers and Hi-lift tracks. What are the "blue" things under the lift landings? Petza914, where did you get the LED light strips? I need something similar.